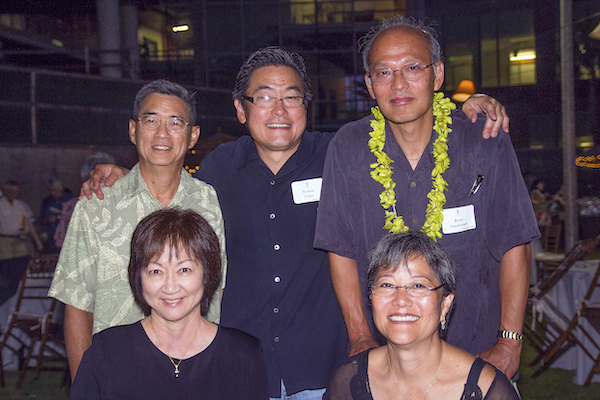 Pictured: Dr. Kenn Saruwatari is pictured second row, right at a JABSOM alumni reunion with Dr. Keith Matsumoto, (JABSOM MD 1979), Dr. Nathan Fujita (JABSOM MD 1982), Dr. Barbara Kitashima (JABSOM MD 1981) and Ruth Fujita. Brothers Kenn Saruwatari (JABSOM MD 1981) and Jonn Saruwatari (JABSOM MD 1986) graduated from the University of Hawaiʻi (UH) medical school when the annual tuition was far below that today’s students must bear. This year, they created the John A. Burns School of Medicine Endowed Scholarship in gratitude and to show their desire to “pay it forward” to ease the financial burden of future medical students at the UH-John A. Burns School of Medicine (JABSOM). When the Saruwatari brothers graduated from JABSOM, the annual tuition was about $1,250, substantially less than the 2019 annual cost of approximately $37,000. They feel extremely fortunate to have completed their schooling without debt, allowing them to pursue the areas of medicine that suited them best. The brothers, both graduates of Yale University, returned home to attend medical school and to practice here at home. Jonn completed his post-JABSOM anesthesiology training at the University of Illinois and practices at Kaiser Permanente. Kenn is did his post-JABSOM training in the UH Pediatrics residency program and is a pediatrician at Pali Momi Medical Center.